With the highest amount of shoreline per person of any country in Europe there’s no doubt that Croatia’s long stretch of beautiful, unspoilt Adriatic coast is one of its main tourist attractions. That is to say nothing of the some 1,185 (mostly uninhabited) islands, reefs and islets, that are scattered right the way down the littoral from the Istrian peninsula in the north to Dubrovnik in the south. In our Croatia Travel Guide we hope to show you that the country has even more to offer tourists than just golden sunshine (almost 3,000 hours per year! ), crystal-clear waters and spectacular beaches. In fact, there’s so much in terms of where to go, what to do and what to see you really will be spoilt for choice. Whether you want to island-hop around the Adriatic, go white water rafting in dramatic river canyons, scuba-dive to explore the underwater treasures of the coast, swim at the bottom of cascading waterfalls or just soak up the incredible architecture and atmosphere from a pavement café situated in the middle of a historical city, you’ll be well catered for in Croatia. In our Croatia Travel Guide you’ll find information about the diverse regions, practical tips and advice for tourists, our own recommendations for sports, cultural events and holiday activities, as well as details on some of the most unique and spectacular places to visit. If you can’t find the information you’re looking for here, please don’t hesitate to contact one of our team of experts at Croatian Villas – the people who really know Croatia. Each region of Croatia has a unique charm. We hope to give you a flavour of the sights, coast, towns and countryside of each area. 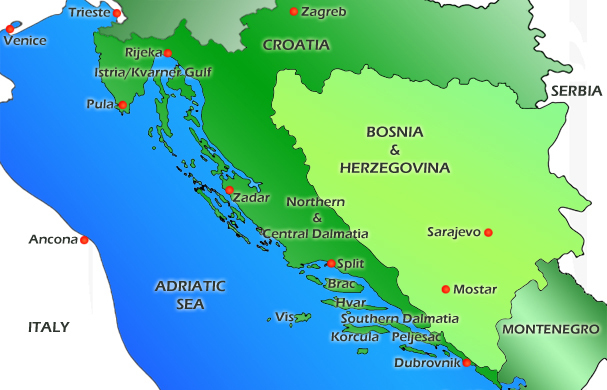 Click on appropriate region of Croatia on the map above to take you to our guides for each region.